About this time of year, people start asking me for natural sunscreen recommendations. With that comes a whole list of things they don’t want in their “organic sunscreen”. Things like: no nano particles or chemicals; no white, chalky or greasy finish; and won’t clog their pores. That’s a major set of requests to fulfill… but I’ve got you covered and protected — like an SPF 50, baby! I’ve put together an exhaustive list of my tried and true favorites amongst the safest sunscreen options for a variety of skin types for your face and body. 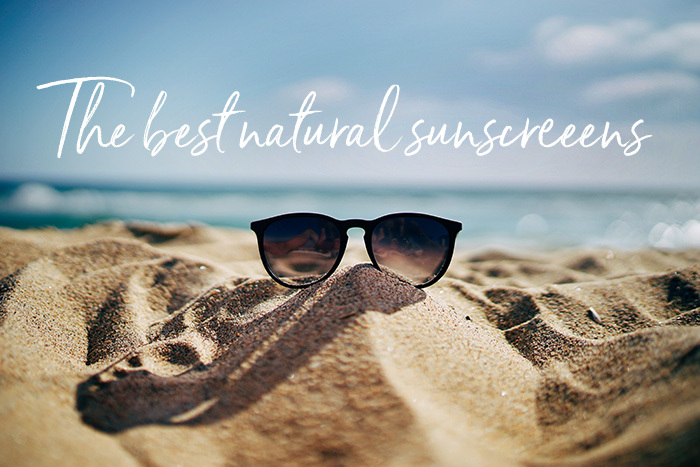 If you want an “organic sunscreen” that’s “chemical-free”, you’re probably searching for the best mineral sunscreen in a natural formula without toxic ingredients, chemical blockers, or nano particles. Am I right? If you’ve taken my Natural Beauty eCourse then you already know I’m a stickler for using the correct terminology – and the terms above aren’t accurate. The safest mineral sunscreen is made with inorganic chemicals…and yes, every ingredient (natural or synthetic) is a chemical. I’ve actually tested each one of these non-toxic sunblocks personally, so I know they work and pass my ingredient stamp of approval. Lately I’ve seen SO many websites pushing out lists of the “best organic sunscreens”. They just straight-up reword marketing lingo the brands sent them, and aren’t careful about the terminology they’re using (or being transparent about ingredients). It drives me crazy! If you want to be able to discern who is telling the truth, check out The Ultimate Natural Beauty Shopping Guide for a deeper discussion on how to shop smarter and understand tricky terminology. Be forewarned: I put in two recommendations for a sunblock that may ruffle some feathers for those of you who are purists (in the waterproof and non comedogenic section). However I consider myself to be a purist, but also a realist and I know there are those of you with different shades along the “spectrum of green” reading this who will want those safer sunscreen options – that also won’t harm water or sea life. Here are the sunscreens and sun blocks I love – and of course they’re all non-nano mineral sun protection! Now you can decide which sunscreen is the best for your needs. The best defense is a good offense. Start by boosting your levels of antioxidants through nutrition to help your skin protect from the inside out. However, I do not think this alone will keep you from burning. So a mineral sunblock is still necessary when you intend to spend a lot of time soaking in some warm rays. Also, stay covered whenever possible with clothing, hats and shade to help minimize your exposure. Super lightweight without a greasy finish, though it has a bit of hydration. 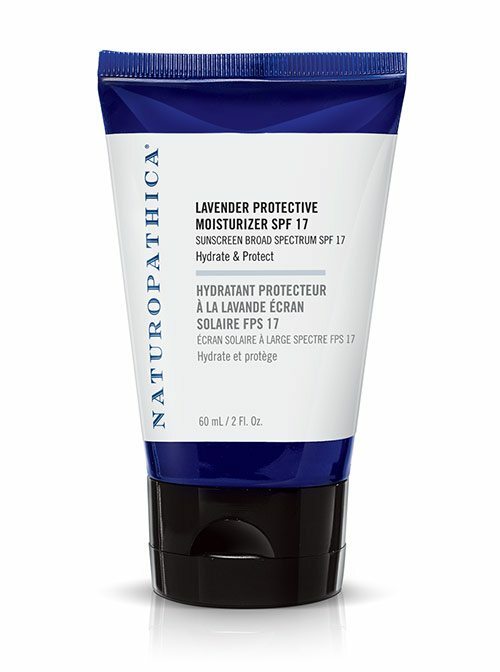 This is an amazing everyday sunscreen for the face year-round, but it is not enough sun protection if you plan to be hanging out a bunch outside. In that case, you should be using something closer to an SPF 30 or SPF 50 like the ones listed below. There are two versions. Non tinted (pictured above) and tinted. Both are totally fantastic. One thing to note is that the tinted sunscreen doesn’t use the tint as coverage to even out skin tone, as much as it tones down the potentially chalky effect of zinc oxide. It dries to a matte finish – so this is also a pick for those with oily skin or in humid climates. 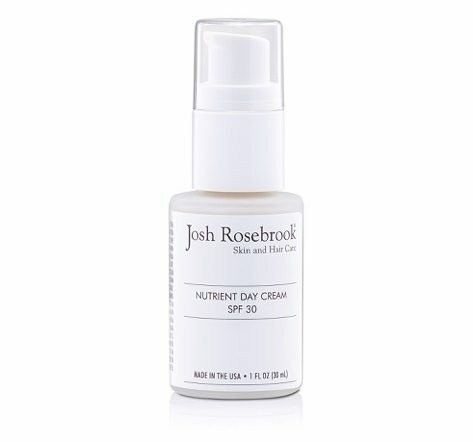 Just like everything Josh makes, it’s filled with only organic, non-GMO ingredients that are seriously skin beneficial. It has the faintest smell of chocolate. YUM! And if you look closely you’ll also see the Nutrient Day Cream also includes cat nip! So both humans and cats may love you more when you wear this. 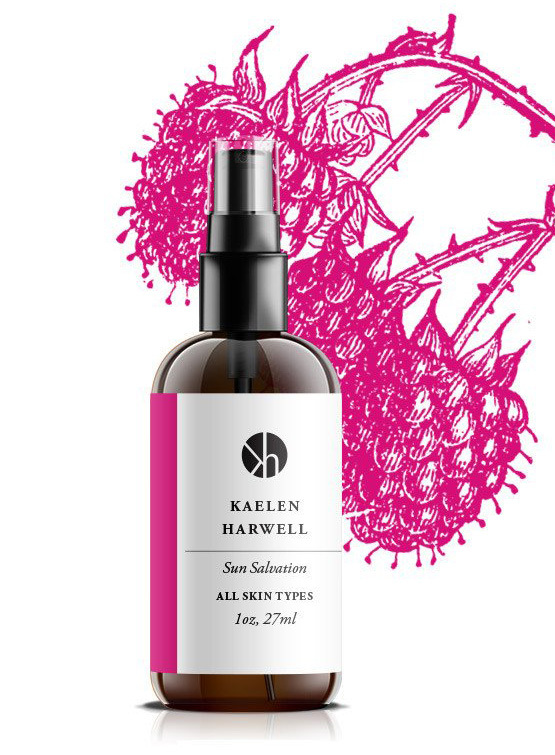 This ultra hydrating sun protection not only has the mineral sunblock you need to protect from UVA/UVB rays, it also contains non-GMO red raspberry seed oil as a way to further ensure the skin’s protection from the sun. Really lovely for skin that tends to be dry or for drier climates. This would be amazing if you were going skiing and needed something to protect your skin on all fronts. It does tend to leave a white cast. 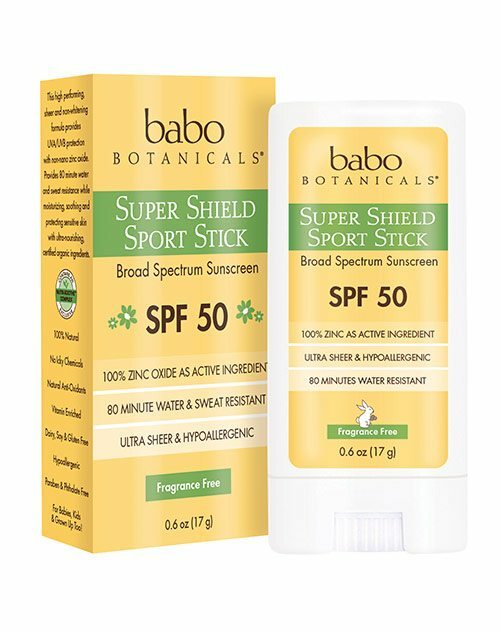 I grab this little sunscreen stick when I need serious protection on my face. It’s called a “sport stick” because this stuff doesn’t budge. Sweat proof and waterproof, it’s ideal if you’re headed to the beach, river, hiking, etc. also because it won’t just streak off the moment you begin sweat or get in the water. For being such high coverage SPF, it’s pretty amazing that it’s not super chalky or heavy when applied. It’s so small (not that you can tell from the huge picture) that I can just toss this in my purse and easily apply if needed when I’m out and about. 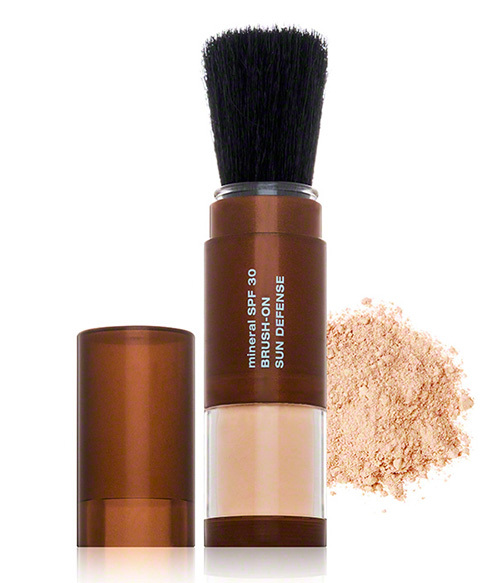 An invisible layer of protection that works beautifully under makeup as a primer. Coming from me, a makeup artist of many years, that’s a big deal. I don’t know how they did it, but it has all the ingredients for sun protection, plus other skin soothers (they’re big on making sure everything is soothing to the area it’s meant for), yet feels like nothing once applied. It slides on and absorbs fast without drying too matte. And so this is great for all skin types, including sensitive skin. I used to have oily and acne prone skin, so I can totally understand if you’re worried about sunblock clogging your pores and feeling greasy. Sunscreen powders are all the rage lately, because they are a perfect way to matte-ify your face, set your makeup and get sun protection all in one. You need to use a liberal amount evenly applied all over the areas you want protection. So don’t skimp. A full SPF 50 from Zinc Oxide, it stays water resistant for 80 minutes, leaves minimal white cast on the skin and feels weightless. I’m loving this for my pale self. I’ve talked extensively with Pacifica about the “parfum” listed on the ingredient label and they provided me with a wealth of information about the high standards that they voluntarily subject themselves to when selecting fragrance that is naturally derived to ensure they are acting sustainably and safely. Those of you who are concerned about fragrance, then may not choose to use this product but everything else about it is totally amazing – filled with natural ingredients that are beneficial to the skin. 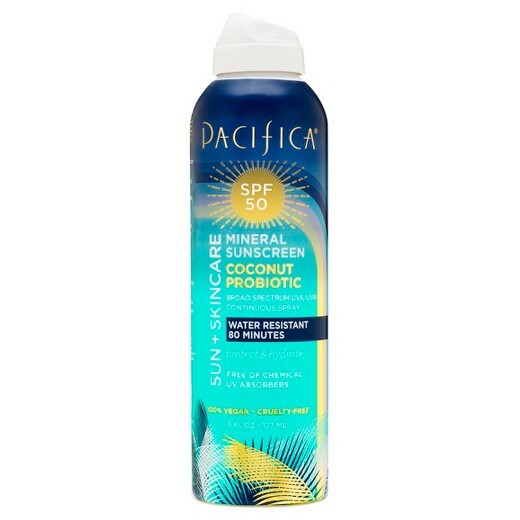 The Pacifica sunblock works well, is ocean safe, vegan and cruelty free. This one is truly unscented and it is awesome! I wear this on my body most of the summer. Particularly on my legs where I like to have more moisture. Badger has always done an exceptional job formulate safe, effective sun block. It’s creamy and covers the skin well. Year after year, I go back to this one. The best sunscreen for sensitive skin can mean so many things. First you’ve got to know, what are you sensitive to exactly? You could be sensitive to plants, nuts, or certain synthetics (like these). So I’m going to go out on a limb and say that the majority of the sunscreen recommendations in this list will work for those with average sensitive skin. If you’re one of the many people experience dermatitis (AKA itchiness, dryness and redness) from synthetic fragrance, you’ll do fine with almost every sunscreen listed above. Most refer to this category of “fragrance-free” sunscreen as “unscented sunscreen.” Again, the terminology here isn’t quite accurate. There are natural scents from the botanicals and essential oils used in many of these natural sunscreen formulas, so don’t think that “unscented” means without any scent profile. To help you make the transition to clean beauty as simple as possible, click the button below to get your free copy of the Toss the Toxins Toolkit. Looking for the best sunscreen for babies? See 17 Of The Best All Natural Baby Products That Really Work for some recommendations. What are some of your tried and true favorites? I’m sure there are several I didn’t mention that you love and would love to hear what they are in the comments below. We may receive a small commission when you buy via the links above. It doesn’t affect your purchase price. It helps support the numerous hours of work and years of research to create highly curated, valuable content- while still being free for you to access. Suntegrity 5 in 1 has been my sunscreen/moisturizer for years. I’m 63 (people think I’m 15 years younger) so I have aging skin but also oily/sensitive and I easily break out with other products. I think Mica and Silica in the Mineral Fusion powder would be irritating to skin plus it contains a lot of the toxic ingredient Titanium Dioxide. I also stay away from Magnesium Aluminum Silicate as is in one of the products above even though EWG has lowered the toxicity level on it. It’s hard to find a sunscreen that works but does not have harmful ingredients. Thanks for all your research! Kristen, this is such an informative round-up. Thank you for your thorough reviews!! 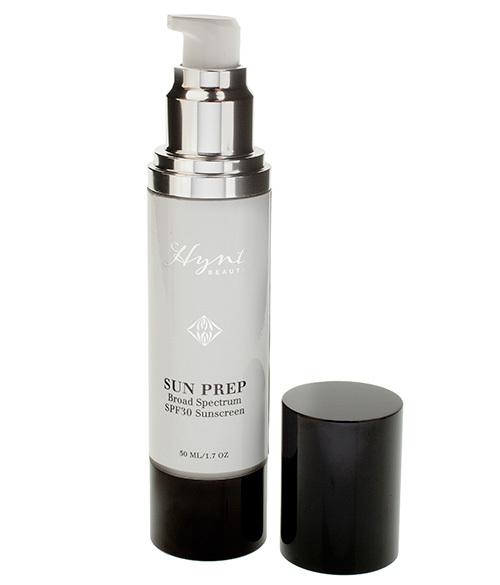 I use the Hynt sun prep and it’s the BEST! Quick question about the parfum in the Pacifica spray: were they able to assure you there are no petrochemicals or propylene glycol in the parfum? I’m allergic to propylene glycol so have to be careful about fragrance, even when it’s “naturally sourced”. Thank you for all your research. I like doing that as well, but there’s so much out there. Have you heard of or tried Keys products? The Solar Rx is a rich moisturizer with an spf of 30+. Hey Cheri!! I’d suggest the one I mentioned in this article for use under makeup, Hynt Beauty. Order a sample and give it a whirl. For the rest of your questions, those are things I consult pros on who are looking to clean up their kits. I don’t offer that info outside of consulting time because it stems from YEARS of my hard earned research and it’s a pretty specific set of tools I’ve built up that would take a lot longer to describe than this one comment would allow. Can I shoot you an email about a program I’m working on that may help answer these questions for you? I’ve had great luck with Juice Beauty Oil-Free Moisturizer SPF 30. I have a difficult time finding things that do not clog my pores or give me cystic acne (thanks, silicones!). This is one, if not the only, sunscreen I’ve found that keeps me from getting burned and doesn’t cause my skin to break out. Ah yes, that’s one I like a lot too! Agreed about the silicones. They make products look great, but what a mess they make on skin after too much use! Hi Kristen! 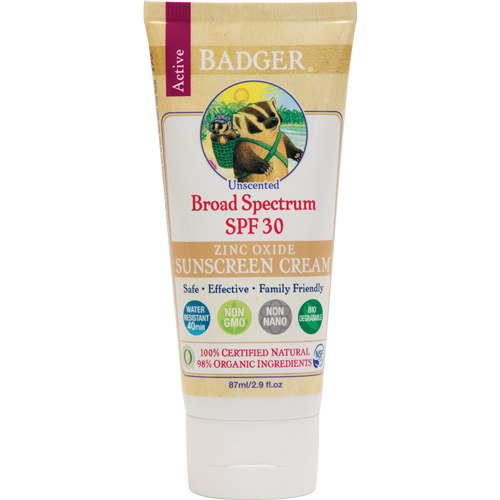 Have you tried the badger face sunscreen? What is your opinion? Also I have read good reviews for the suntegrity sunscreens? Have you tried it? Last comment: EWG does not recommend the use of sprays. What do you think? Please let me have your comments! Thank you!! Yes I have tried the Badger face sunscreen. For me, it’s quite thick, and the non tinted a bit white and a little greasy for my taste. The ingredients are superb though! I am going to have to do an addendum to include Suntegrity because it’s definitely a winner and one I have enjoyed using in the past. I can understand about the spray. The one I recommended does not include flammables for the spray to work. I personally spray it directly into my hand and then onto my body. Just an application preference that I find works best for me from a coverage, inhaling, and waste standpoint. Hi Kristen! Thank you very much for your reply! Someone told me today that she has some concerns over the ingredients of suntegrity sunscreen. What do you think? P.s thank you for all the valuable information you share with us!! Sure thing! Which ingredients does she express concerns over? I don’t see any that stand out. Ah yes, got it! Heavy metal contaminants is something I cover in The Ultimate Natural Beauty Shopping Guide. Short answer is that it’s hard to know. You have to trust the brand’s quality assurances. Which one are you worried about preservatives? If there’s no water, then it needs far less preservation system. Probably best to have her comment specifically. I feel like maybe it’s a bit of “telephone” we are playing. Oh I tried Badger’s Rose face formula from last year. Is that the one you mean? Hi Kristen! Can you let me know your thoughts re the email I sent you about suntegrity sunscreen? Thank you!! Hi dear! I get so many emails (and social comments) each week with specific requests — and was traveling all last week for work. Gotta keep the lights on and the website running. So emails for personal questions which aren’t part of my appointment schedule, unfortunately get slower replies since I’m a one-woman show doing all this. 🙂 In fact, I have some info to share re: Suntegrity soon. Thanks for your patience! Any thoughts on Ursa Major Force Field? I would especially be interested for those with acne prone skin. Any problems with the Hynt Sun Prep and breakouts? Thanks so much for all the wonderful info! Hey Rachel, I’ve never tried the Ursa Major one. Have you? I think the Hynt would also work well for acne prone skin due to the lightness of its texture and ingredient profile. And thank you for being appreciative and chiming in! Hey Kristen! I always appreciate your tips and advice! 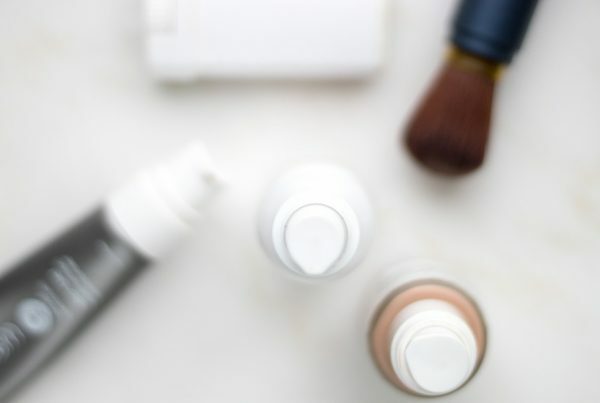 I was really hoping to see a moisturizer with SPF on this list as I often find mineral sunscreens don’t have the greatest texture for every day wear. Also, my favourite sunscreen for face is the Juice Beauty CC cream- I’ve been using it for years and it’s amazing! I can totally understand that. It depends on your skin type which is why I made a point of calling out those for drier skin above. Many of the ones above double as moisturizers. Particularly the Kari Gran and Naturopathica. So it kinda depends. The Juice Beauty CC cream is great for some, but found that others like myself, react to some of the ingredients. Glad it works so well for you! Thanks for adding in your favorite as an additional suggestion. These are the ones I’ve tried and love. I haven’t tried all the sunblock in all of the world – no surprise there – that’s why I asked for your faves too! Oh yes, you and someone else reminded me about MyChelle. Great to hear you are liking them so much. I have used their sunblock in the past and really liked it, but haven’t used their newer items. So thanks for sharing that. I’ll have to do an updated version and include them after I’ve tried. And you’re welcome for the recommendations!